Read ThePopTort - Find a (Mature) Date! 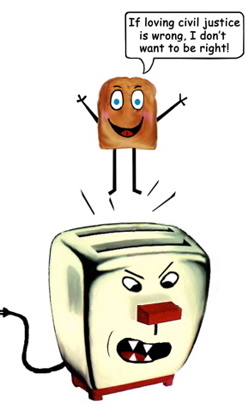 [C]an a consumer advocates blog dealing with civil justice be cute? This blog proves it can, complete with an adorable “Pop Tort” logo, even while exploring such issues as Medicare and Medicaid lawsuits, nursing home scams, and medical malpractice against the elderly, among other legal issues. And considering the fact that Zen College Life also includes us on their top 50 Legal Blogs list, we must ask the question - is there any age group that doesn't like us? Clearly not. We couldn't be more honored! Sure would have loved to listen in on insurance industry conference calls when Repeat Offenders from Americans for Insurance Reform hit the newsstands last week (you know what we mean!). So far, judging by the jumbled responses, these must have been some phone conversations! They sure have us scratching our heads – although not in a disgusting dandruffing kinda way but rather in a nicely-styled kinda way, at least so far. AIR did this report for a few reasons. First, to show that while the country has been in a “soft” insurance market since the mid-2000’s (low rates), the industry is taking advantage of 2011 weather events to push itself into a new “hard market,” raising rates on businesses and professional groups for the first time in years. Second, AIR wants to prove that the industry does not need to do this now, as it is in an all-time safe financial position and one might even say overcapitalized. And third, AIR sought to explain how “hard” insurance markets have taken hold three other times, each time degenerating into a “liability insurance crisis” for policyholders. And whereas industry lobbyists and PR people end up blaming lawyers, judges, juries and injured victims for creating this hard market, the tort system actually has nothing whatsoever to do with it. Information is power – that’s our motto! 2. Despite all this weather, the industry is well-capitalized - rates really don’t need to go up. Hartwig again: “The fact that insurers and reinsurers entered 2011 with record capital on hand to pay claims is unambiguously a good thing for all policyholders. Moreover, over the past four years, while the Great Recession and its aftermath forced hundreds of thousands of businesses to fail, including hundreds of banks—not a single traditional property/casualty insurer failed as a result of the financial crisis and not a single valid claim went unpaid. [Well, clearly that’s not true but we’ll keep going.] … The bottom line is the property/casualty insurance industry is a financially strong, highly competitive, resilient and essential industry in the United States and around the world." [I]ncreased pricing trends reflect improved underwriting discipline in reaction to challenges such as lower reserve releases, weather-related losses, low investment yields and a sluggish economy. However, Moody’s says that while it expects “further price strengthening,” the rate of increase will be gradual due to the industry’s level of capital. Wow. Did AIR really do something important here by exposing the industry and possibly holding off a crisis? Boy we sure hope so. In any event, we couldn’t agree more: the industry is plenty capitalized, there's clearly no need for spiking insurance rates, and no matter what happens, lawsuits and the tort system have absolutely nothing to do with any of this. It’s a fascinating end to 2011 as we sign off until 2012, PopTort fans! If something big happens we may be back to tell you about it but otherwise, have a very happy holiday and don't forget to pay attention to John Lennon. Back soon. We got a call the other day from a mysterious high level government official asking us to solve the debt crisis by looking for patterns in magazines and newspapers and deliver our results to a secret mailbox. Better watch out, corporate America! On second thought, maybe we’re hallucinating (or at least staying up way too late watching Russell Crowe movie reruns). Well whatever it is, I’m afraid we’ll need to take a little time off so that we can either go crack encrypted enemy communications to save the civil justice system or go to the beach. But whatever it is that we'll doing, we hope that you have a wonderful rest of summer. We’ll be back in no time! Thank you, PopTort Fans and the ABA Journal! 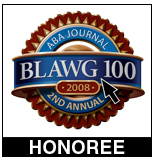 Well, the voting has ended at the ABA Journal and we are so happy that ThePopTort ranked #4 in the “torts” category, among the top 100 blawgs! Also a special shout out to our friends who shared the honor of landing in the top 100, also in the “torts” category, including Bill Marler, food safety litigator extraordinaire and Eric Turkewitz, who covers New York issues with great aplomb. We look forward to next year. But for now, we are thrilled to have made the list for the last three years – our entire little life! Thanks everyone! It's that point in the summer again! ThePopTort must go away once more on special assignment. As in the past, the exact nature of our work must remain classified - for now. But rest assured, know that we’ll be back no later than September 7 - and maybe even earlier - ready for the civil justice battles ahead. In the meantime, drink your martinis stirred, not shaken, and stay out of trouble! Well, civil justice fans, it’s come to that point in the summer when those of us here at ThePopTort have to go away on special assignment. Unfortunately, the exact nature of our work must remain classified for now. But rest assured, we’ll be bringing our usual array of master disguises, state-of-the-art communications equipment, and vital sources of sustenance to help keep us strong for the civil justice battles ahead. In the meantime, know that we’ll be back September 8, with wild tales heroism and hijinks in tow. So until then, keep your chins up, drink your milk, and as always, keep on rockin’ for civil justice!